The first time I used yeast, I accidently killed it. The cinnamon roll muffins that I was attempting to make turned out more like cinnamon roll hockey pucks. I called my little sister to complain and she told me that the water I dissolved the yeast in was probably too hot, thus killing the yeast. Ugh… darn that yeast! That was back when yeast intimidated me. The very idea that you could “kill” it gave me anxiety. Luckily, I got over my fear of baking with it pretty quickly. All it took was one successful recipe and I was hooked. There’s something incredibly satisfying and almost magical about making your own bread. The way that yeast can transform simple ingredients like flour and water into something as wonderful as bread excites me every time. Over the last couple of years, I’ve tried a lot of different bread recipes and one of the things I find myself making time and time again is pizza/flatbread dough. It’s easy if I need a little bread to go with dinner or it’s dinner itself covered with cheese and other toppings. After trying a lot of different recipes and a little experimentation, I eventually developed this recipe, which has been my go-to for a while now. I decided to keep the version for this post simple with just a sprinkling of coarse salt and freshly ground pepper, which is what I do when I serve this bread alongside dinner. It goes well with just about anything and you’ll be amazed at how good this bread is for being so simple. When I do add toppings (cheeses, sauces, meats, etc. 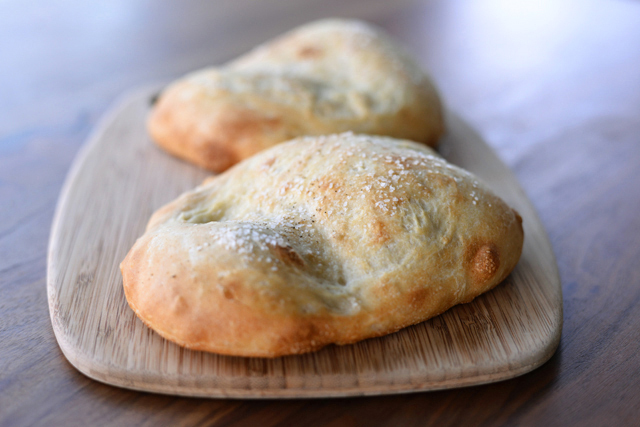 ), I work the dough a little more so that it doesn’t puff up as much as the bread shown here. It’s not an exact science, but it works just fine for me. I’m sure an actual bread maker would cringe at my lack of precision, but I’m okay with that. 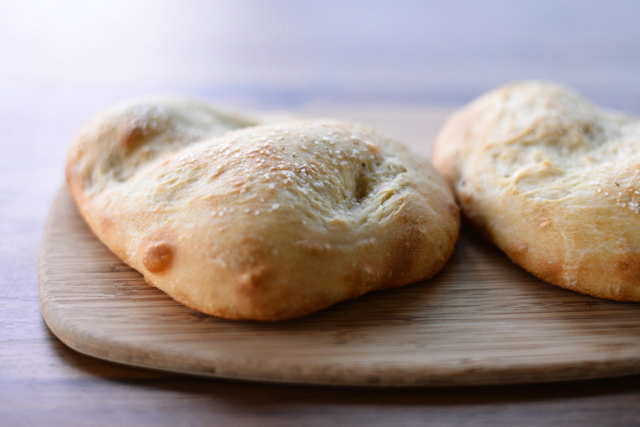 For anyone that gives this recipe a try, I’ve made a few notes throughout the recipe so you know exactly what I do to make, bake, and store the dough. Also, get creative with it. You can top it with whatever you want. One of my favorite ways to use the dough is to smear it with homemade pesto and cover it with grated mozzarella before baking. Seriously delicious! In the bowl of a stand mixer fitted with the paddle attachment, mix together the flour, yeast, and salt. Add the lukewarm water and 1 tablespoon of the olive oil. Mix until the dry ingredients have just absorbed the wet ingredients. Change the attachment to the dough hook. With the mixer on medium speed, knead the dough for five minutes. Dump the dough out onto a lightly floured surface and finish kneading the dough with floured hands, until the dough comes together in a ball that is smooth, elastic, and springs back when touched. If the dough is really sticky, you can knead in additional flour, but keep in mind that the more you add the tougher your bread will be. 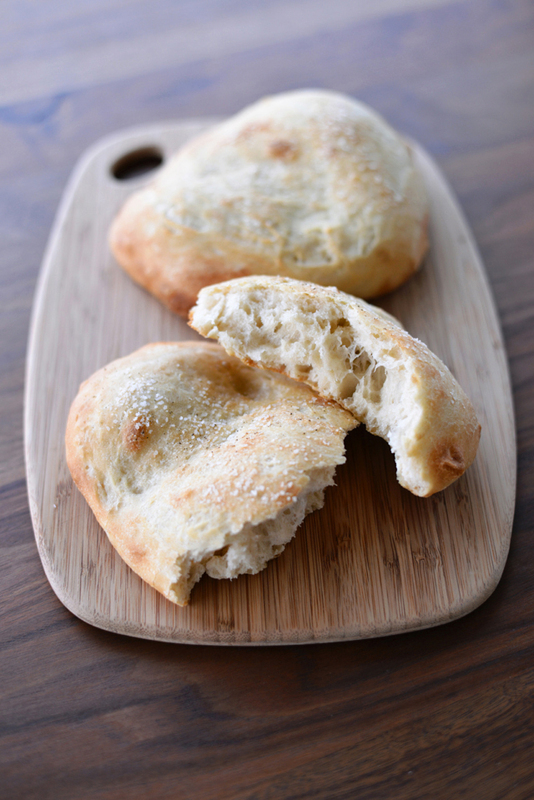 Coat a large bowl with 1 tablespoon of olive oil, place the dough ball in the bowl and give it a few turns to coat. Cover the bowl with plastic wrap and let the dough rise for about 45 minutes or until the dough has doubled in size. Meanwhile, preheat the oven to 475 degrees. To bake, lightly brush the bottom of a baking sheet** with olive oil. Stretch and flatten 2 pieces of the dough***. Lay them on the baking sheet and brush the tops lightly with olive oil. Sprinkle with coarse salt and freshly ground pepper (or any other toppings of your choice). Bake in the middle of the oven for 10 to 15 minutes, until golden on top and bottom. Repeat with the remaining 2 pieces of dough. *Note: At this point you can save the dough for use at a later time. Place each dough ball into its own plastic bag (quart size freezer bags are the perfect size). Then store in the fridge for up to a day or in the freezer for longer. Defrost any frozen dough in the refrigerator before using. **Note: I get a better crust when I use my darker baking sheets (rather than my lighter ones). I suspect a pizza stone would work even better if you have one. ***Note: The more you work the dough, the more air bubbles will deflate, and the less your bread will rise when it bakes. 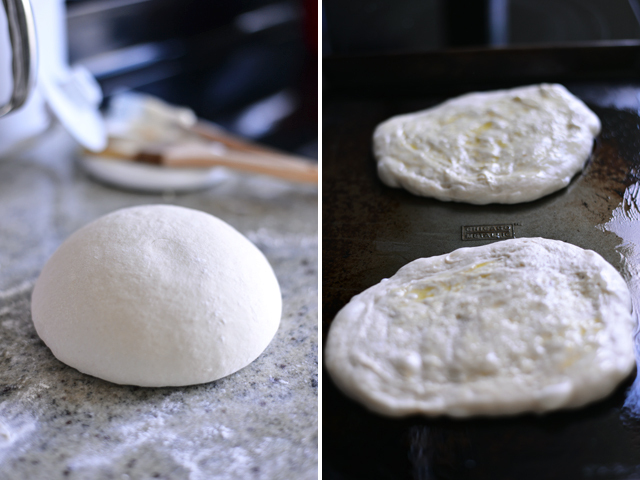 If I’m making a flatbread or pizza with toppings, I work the dough more so the bread doesn’t puff up as much. If I’m making this bread to eat alongside dinner (like the one pictured), I work the dough more gently to encourage a little height. This looks DELICIOUS! I agree that baking bread is satisfying and almost magical. Unfortunately, it is somewhat of a dying art in our day and age. I had to smile at your statement “The very idea that you could “kill” it gave me anxiety.” I made sourdough bread and rolls for several months (maybe even years). When I went to the hospital to have Tyler the starter was apparently neglected too long and it “died”. Although Tyler was definitely worth it, I was sad to see my sourdough go. Have you seen any recipes for starter? I received mine from a friend (who received it from a friend), so I have no idea how to make it. Actually, the beautiful bread book you got me for my birthday has instructions for making a starter. It’s basically a mixture of flour and water that is left out to ferment and then you “feed” it and “train” it until it is ready. Kind of sounds like having a pet, doesn’t it? Anyways, I’ll let you know once I try it and if all goes well I’ll bring some to you the next time we visit. There’s nothing more delicious than lots of lovely homemade bread to mop up whatever you’re eating. Your flatbreads look lovely and although I love more adventurous toppings, it’s hard to beat a plain and simple version with some lovely coarse sea salt. Thanks Debs! It would go great with soup! Thanks so much for sharing this Connie! I haven’t tried to make flatbread yet and yours look so fabulous. I could imaging having one of these with a fragrant tomato and basil salad. Yum! Ooo, that sounds like a great combination. Gorgeous textures, the crust looks great and then it’s so fluffy inside. And your version with pesto and cheese, yes please! Thanks! I highly recommend the pesto with cheese version–it’s one of my favorite easy dinners. The pesto and cheese by itself does sound good. I’ve often made it with chicken and called it pizza but can imagine it’s good without meat as an accompaniment with pasta. Nice pics!